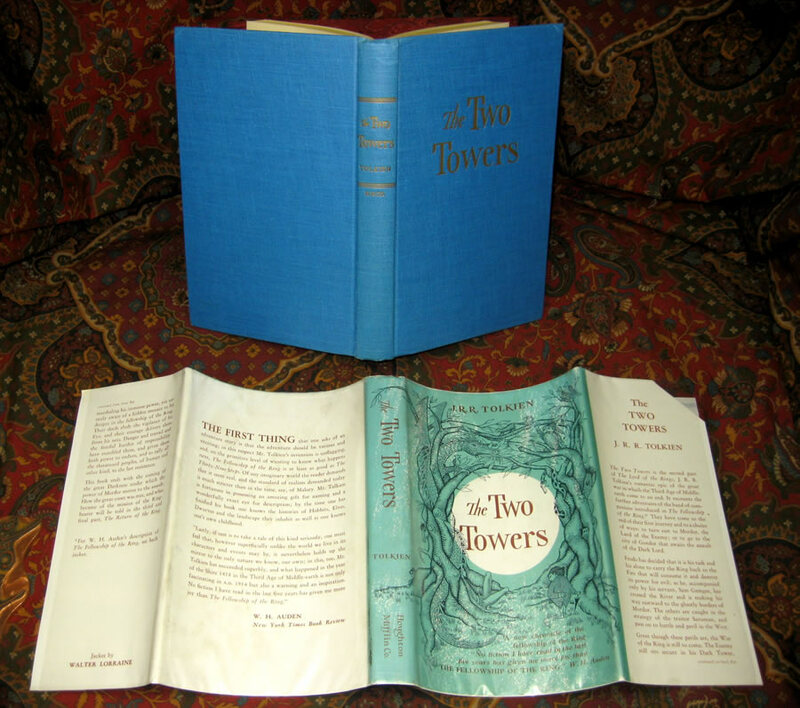 Published by Houghton Mifflin, 1954/1955/1956 1st US Editions, 1st impression/1st impression/1st impression, respectively. 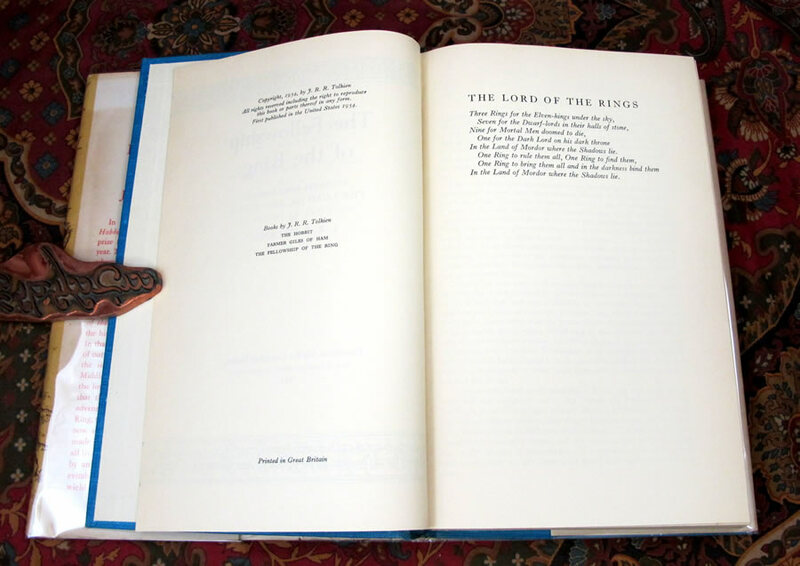 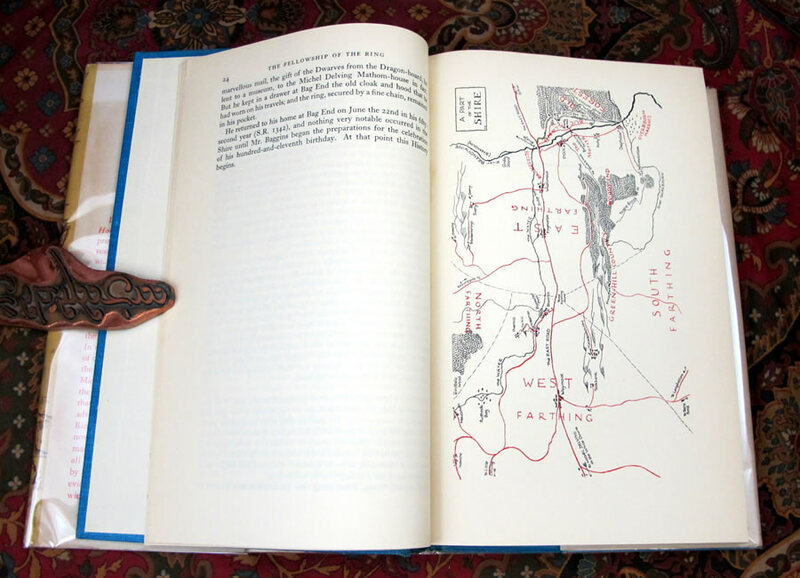 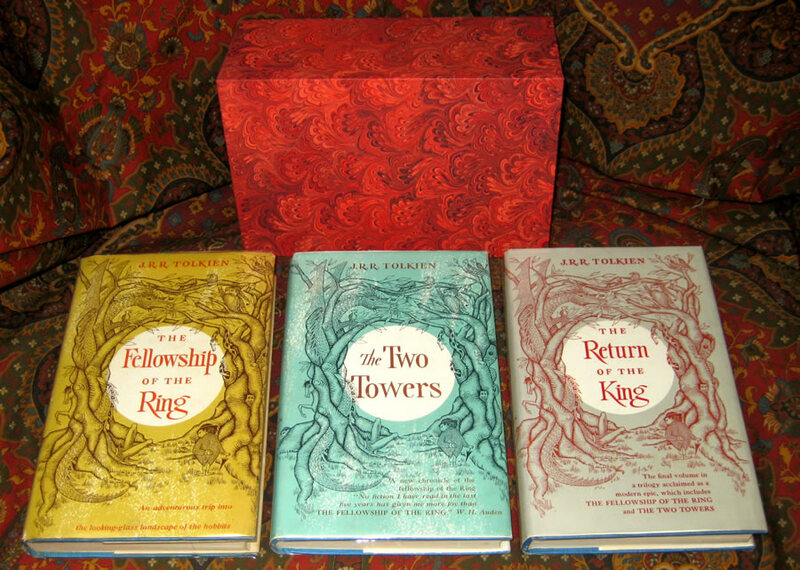 The Fellowship of the Ring is the true 1st US printing or impression, from the same print run as the UK edition, with the 1954 date to the title page. 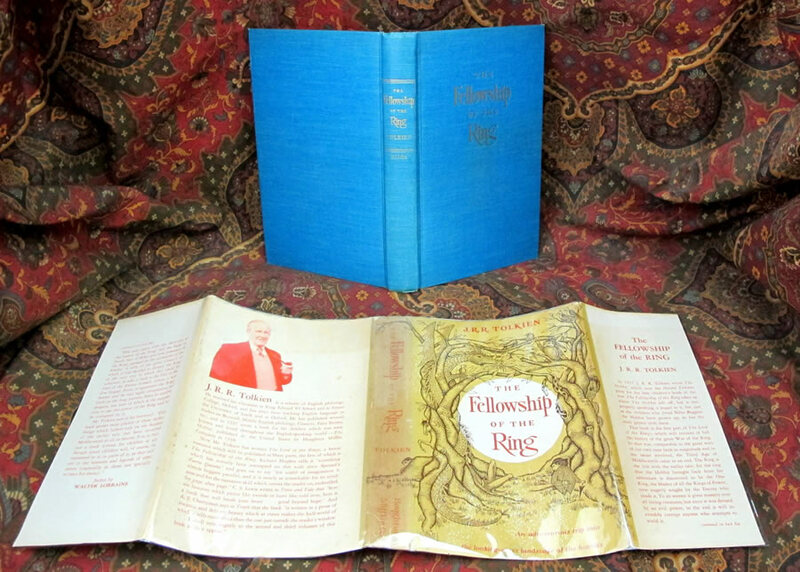 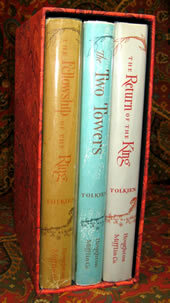 The dustjacket of the Fellowship of the Ring has a closed tear at the base of the spine, reinforced with archival tape to the inside, a small scuff to the top rear corner of the spine fold and a tiny amount of scuffing or loss to the tips of the folds. 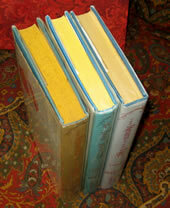 The dustjacket shows a small amount of tanning to the spine, but still presents beautifully. 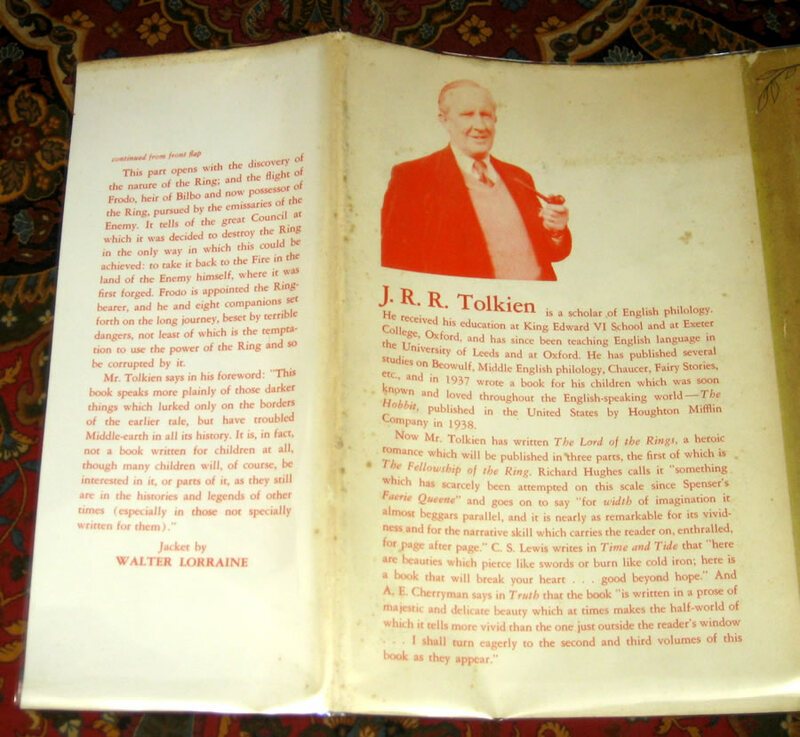 It has the correct issue points with the ascender clipped on the 'd' in 'Frodo' on the tenth line of the blurb on the back flap. 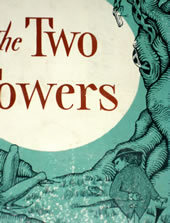 The following 'o' is not nicked as is found on later dustjackets. 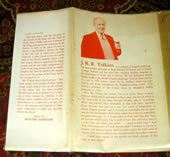 The photo on the back of the dustjacket is cut straight across, not in the 'V' shape found on the 3rd & 4th impressions. 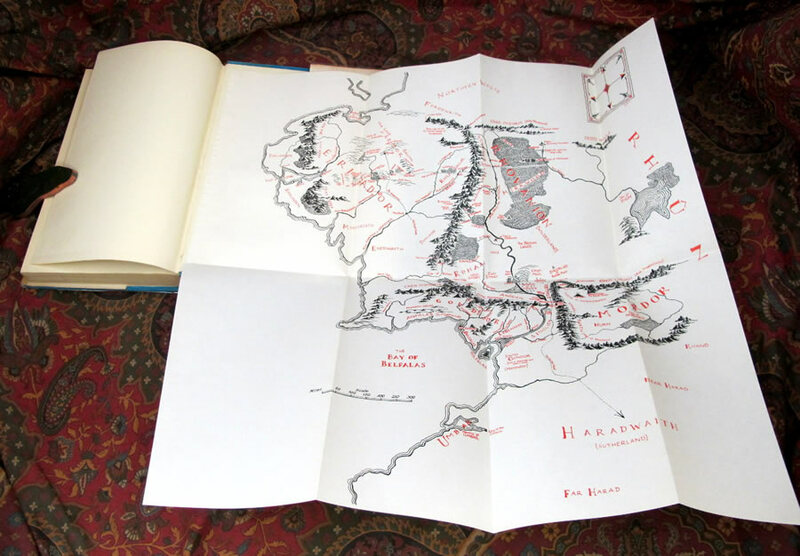 Overall Very Good Plus/Near Fine condition. 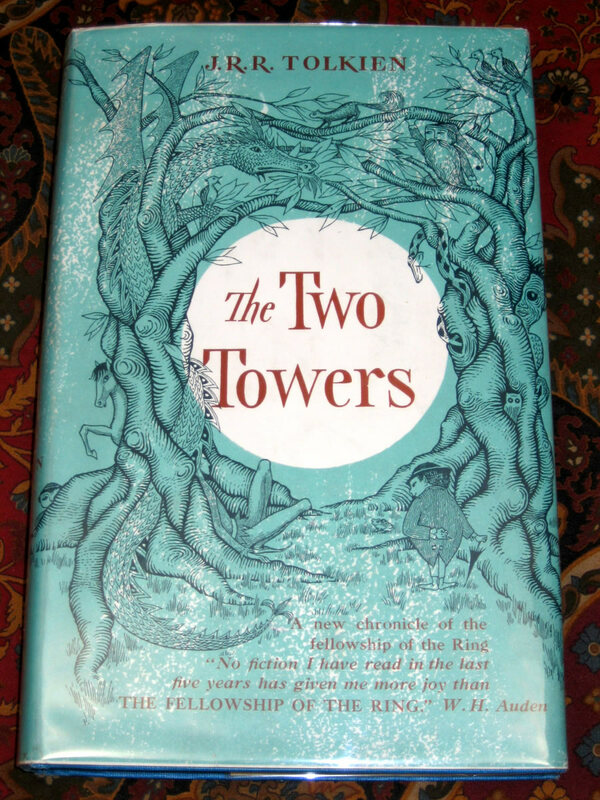 The Two Towers is also the true 1st impression, with the 1955 date to the title page, from the same print run as the UK 1st. 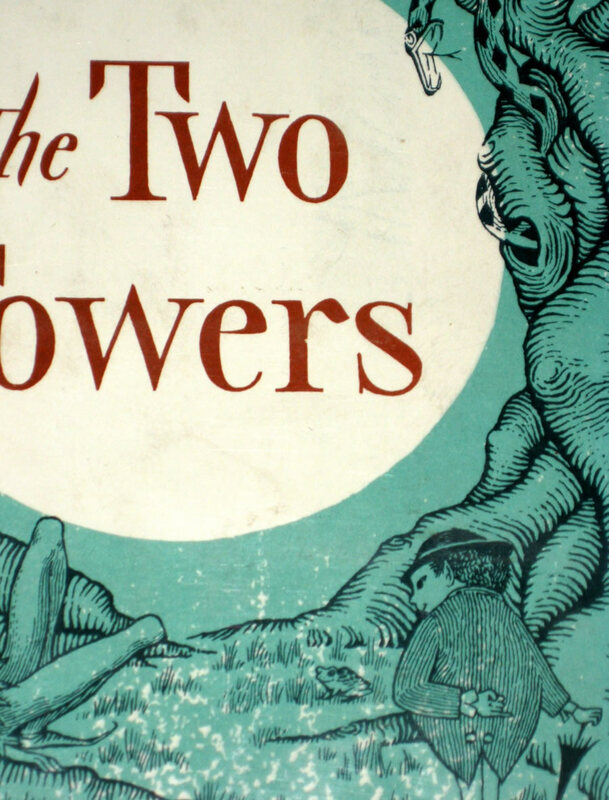 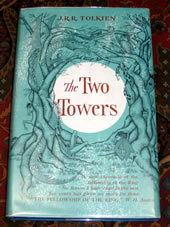 The dustjacket shows the 1st printing points of the 'stripe' at the upper and lower edges of the front panel, and the 'notch' in the 'r' of Towers. The notch is only found on the 1st impression dustjacket, where the stripe defect is found on some later printings. 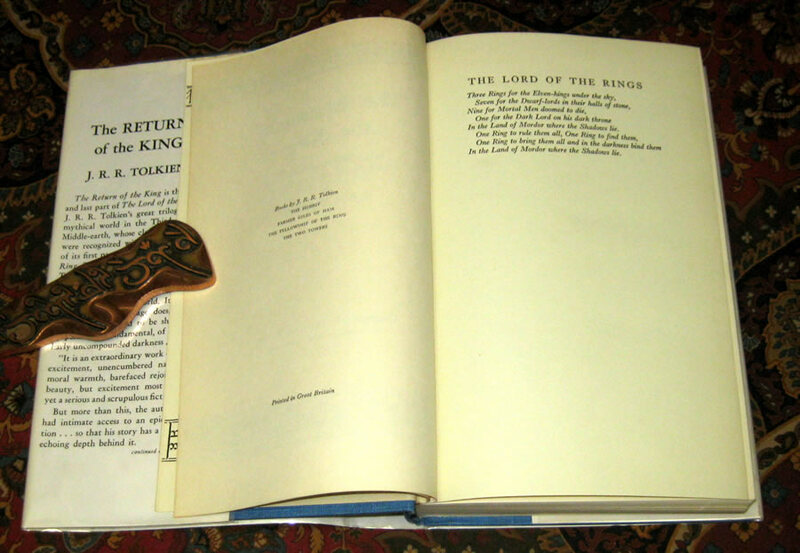 The book and dustjacket are both in Near Fine condition, no names or writing, no foxing or offsetting. 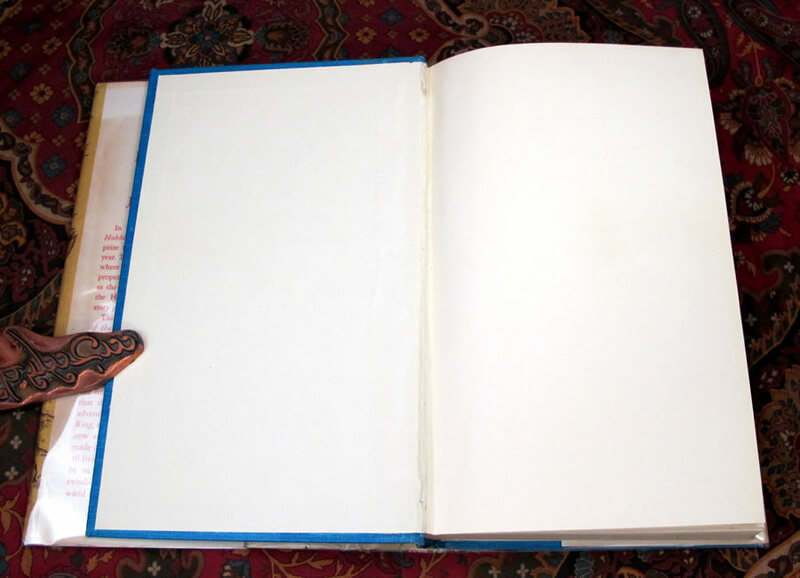 area, with a tiny amount of scuffing to a couple of the flap fold tips, otherwise Fine. 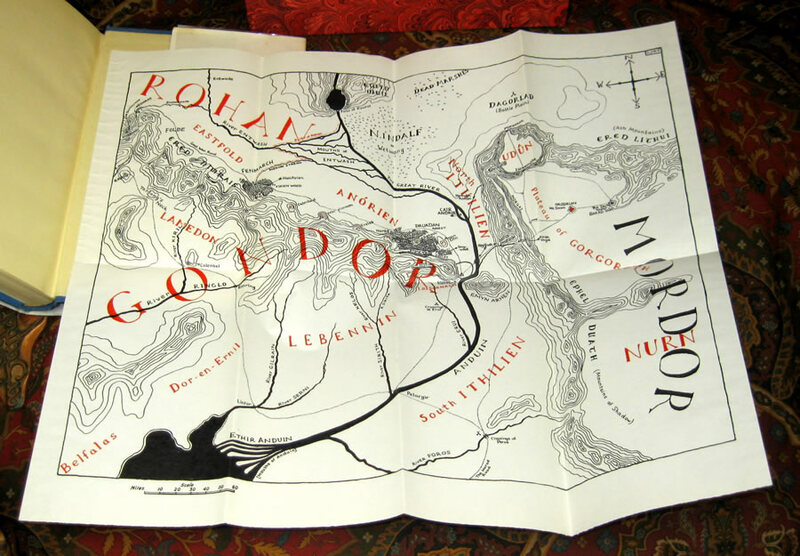 The map is still attached to the rear pastedown, in Near Fine condition, no tears or extra folds noted. 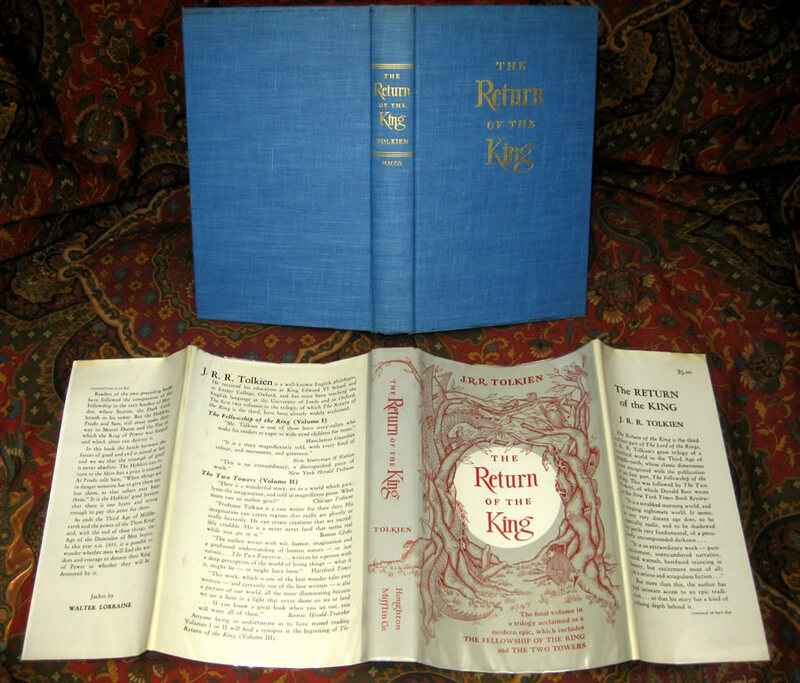 The Return of the King has some rubbing to the front & rear pastedown, under the dustjacket, probably from removal of an older style protective cover that was taped down. 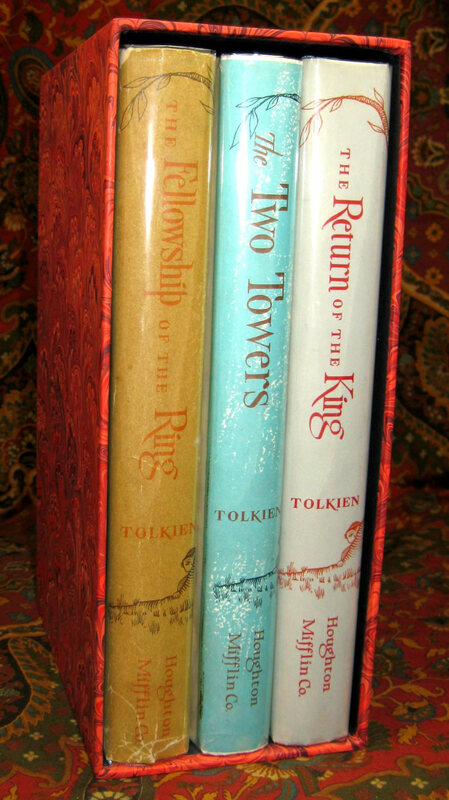 The dustjacket exhibits the correct issue point for the book, including the oversized '5' in the price with double uprights on the Return of the King, and shows no faults whatsoever, Near Fine. 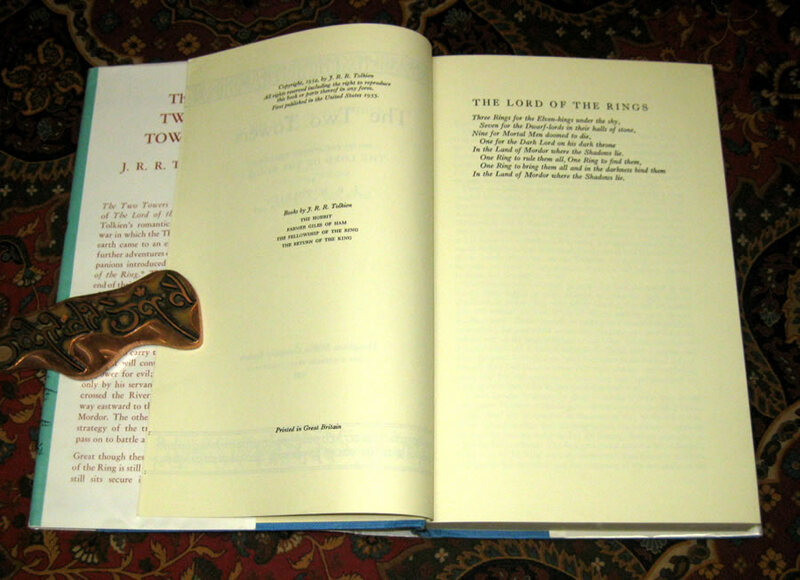 The books are tight and clean without inscriptions or writing. 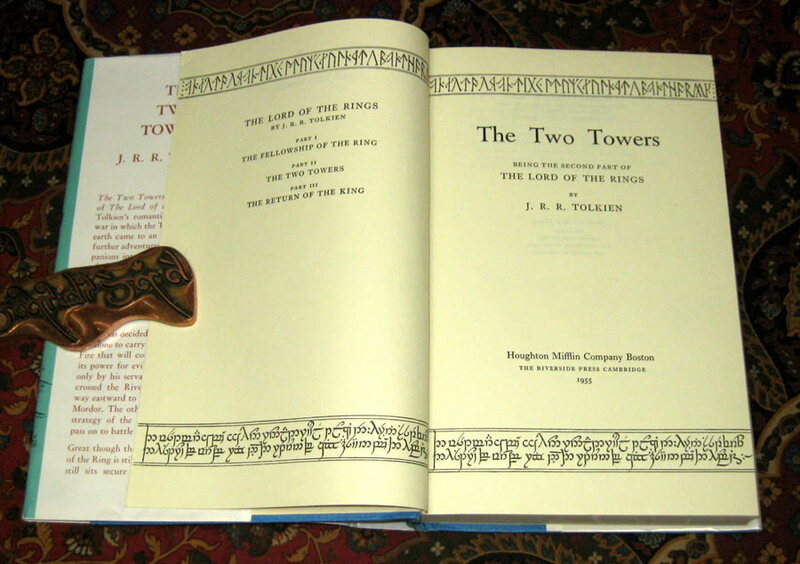 The Two Towers is the only book that is price clipped. 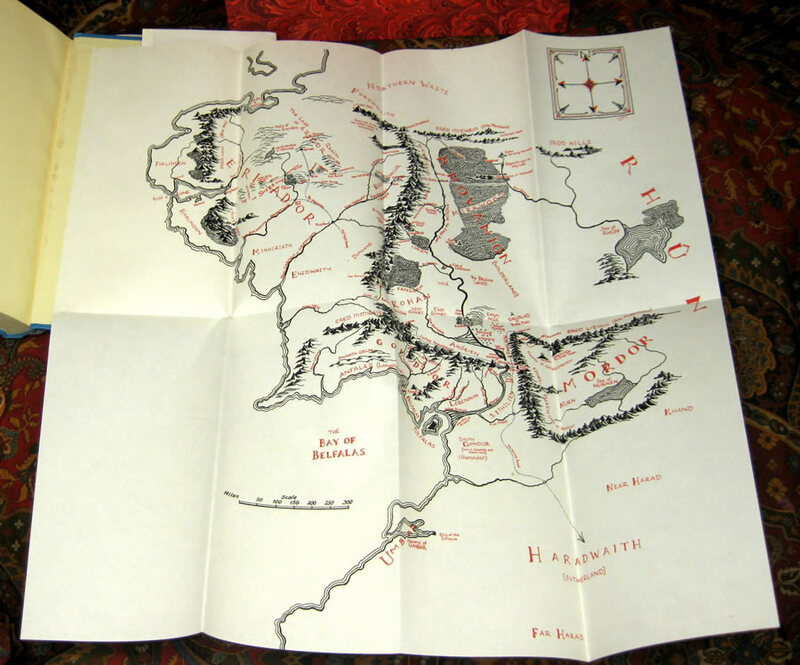 The original maps are present in all three volumes, no extra folds or tears noted, 1st state maps in the Fellowship and Two Towers with the red dot on the coast of the Havens of Umbar. 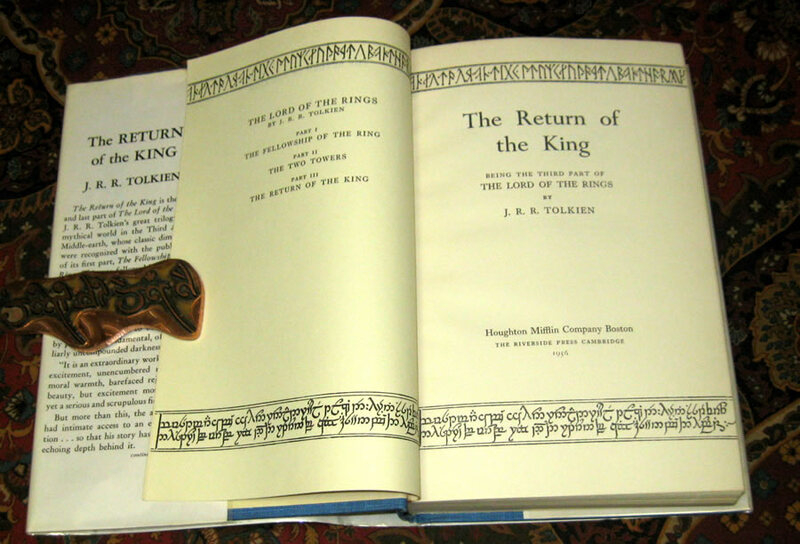 The Return of the Kings map is the correct 1st impression, with the size being approx. 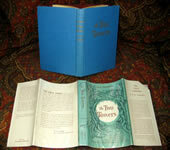 16.5 X 14 inches, with a 'Borough Mill Bond' watermark, no tears or extra fold noted.